The other day, we received a Bomb in the mail. Don’t worry, we're quite all right. It was actually The Bomb from iFrogz. 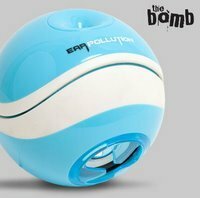 The Bomb is a set of speakers that can join together to form a ball shape. Granted, we'er not certain why they chose ball shape, but when they are separated, the speakers look like Yin and Yang symbols. The 50 mm speakers carry 2W each, with a nominal impedance of 4 Ohms. These two speakers are always connected by a curly cord that joins them. These speakers can connect to anything with a 3.5 mm input jack, but they still need power. Power can be accomplished with 3 AAA batteries, or just using a USB internet connection. Now, there is only one thing we don’t like about the Bomb: the name. Imagine if we tried to get this through airport security and they saw the word “bomb”. Maybe it’s called that because these speakers are “the bomb”. They are pretty good. Not only that, but they have that “Ear Pollution” label. We know that we said this about the CS40 headphones, but we just don’t understand the word “Ear Pollution”. We would hope that this would be good on my ears, not toxic waste. You should be able to get the Bomb at the iFrogz site for about $39.99.